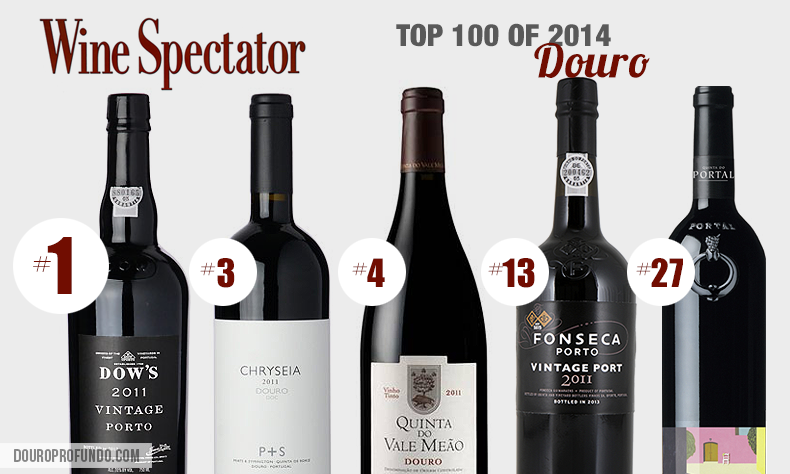 2014 has been a great year for the Douro, with recognition for its quality wines spreading world-wide. Just a few weeks ago, Wine & Spirits included Douro wineries in their Top 100; the trend continues with another respected acknowledgement in the wine world: Wine Spectator’s Top 100. This year, three Douro wines claimed spots in the 4 top positions, including the prestigious number 1 spot. That’s not including the rest of the Top 100 list, which included another Port wine: Fonseca 2011 Vintage at #13, as well as Quinta do Portal’s 2011 Colheita at #27. Another Portuguese wine: João Portugal Ramos Reserva 2012 of Alentejo also made the list at #56, which made this a great year for Portuguese wines! Wine Spectator reviews almost 20,000 new releases every year, they begin with 5,000 wines that have a score of 90 points or higher, and narrow it down to just 100. The list is created using both subjective and objective opinions, beginning with a blind tasting, and then the reveal where all factors are considered (including value, innovation etc. ), then ends with a vote. Learn more about how they choose the wines on Wine Spectator. All 5 of the Douro wines are from 2011, which some Vintners claim is the best Vintage in 50 years. 2011 provided excellent conditions, with rainfall from the last three months of 2010 creating water reserves in subsoil, with the bulk of the year being exceptionally dry, then rainfall again in late August and early September which is ideal for the final ripening stage. An impressive year for Douro wines and Port wines across the board; in fact, a staggering twenty five Vintage Ports from 2011 received 95 points or more from Wine Spectator, with Dow’s receiving the most points at an impressive 99 points. A surprising win, considering this Vintage Port is incredibly young, just 3 years old and already has enough quality and potential to earn the highest honor from Wine Spectator. Most Vintage Ports need to age at least 10 to 20 years in the bottle, and only improve with time. #1 Wine Spectator’s Wine of the Year – Dow’s 2011 Vintage Port: Five members of the Symington family worked closely together on this particular Vintage, only the six best of 44 fermentation lots were chosen for the final blend. Two-thirds of this Vintage blend comes from Quinta do Bomfim, in Cima Corgo just outside of Pinhão, and Quinta da Senhora da Ribeira in Douro Superior. The most prominent grape varieties are Touriga Franca and Touriga Nacional, each accounting for 40% of the blend, Sousão at just 10% for depth of color, and the rest comes from mixed old vines (vinha velhas). Aged just 18 months in oak before being bottled. Kim Marcus mentioned that it is enjoyable young because of its slightly drier profile, with less residual sugar and compact tannins, all reflective of modern Port winemaking; however, she suggests waiting until at least 2020 to open it, with potential to age well even longer. See the full review on Wine Spectator. About Dow’s: Dow’s was originally founded in 1798, and is now part of the prestigious Symington family group. Dow’s produces the full range of Port wines including Ruby, Tawny, Vintage, LBV, Colheita, Crusted, White and Single Quinta Port wines. The brand incorporates four vineyards, Quintas Bomfim, Senhora da Ribeira, Cerdeira and Santinho, and has been an innovator in the automated, robotic treading to aid in consistency and temperature control, which is important in the harsh conditions found in the upper Douro. They describe their wines as having a distinctive drier finish, and have made it a trademark characteristic for the Dow’s brand. #3 Prats & Symington Chryseia 2011: A blend of just Touriga Nacional and Touriga Franca from the estates of Quinta de Roriz and Quinta da Perdiz, aged in new French oak. Kim Marcus calls it powerful, with concentrated red plum, raspberry and dark currant flavors, with dark chocolate notes and grippy tannins. It is expected to have excellent aging potential, and will peak between 2016 and 2020. About Prats & Symington: A partnership between Bruno Prats and Charles Symington that began in 1999, in hopes of applying Bordeaux winemaking methods (particularly prolonged maceration, allowing for the gradual and gentle extraction of tannins, giving the wine a characteristic finesse) to grapes that are traditionally used for the production of Port wine. Charles Symington is a part of the famous Symington family, who own multiple estates including Graham’s, Cockburns, Dow’s and Warre’s among others, with vineyards spanning more than 900 hectares across the Douro. Bruno Prats managed the Cos d’Estournel estate in Bordeaux for thirty years, which belonged to another member of the Primum Familiae Vini, whom the Symington family are a part of. After selling the estate, Bruno worked in both Chile and South Africa, and was eventually approached by the Symington family regarding the partnership which would become Chryseia. The Chryseia 2000 was the first vintage to be released as part of this project, they also produce a range of still wines and Port wines from both Quinta de Roriz and Quinta da Perdiz. #4 Quinta Do Vale Meão 2011: This wine is a blend of Touriga Nacional, Touriga Franca, Tinta Barroca and Tinta Roriz, all sourced from single-variety blocks, which is uncommon for older vineyards. Each variety is also vinified seperately, trodden by foot and aged in French oak (80% new). Kim Marcus describes the flavor as being full of dark fruits, spice and hints of chocolate with silky tannins, and a long finish with mineral notes. Expected to be best between 2015 and 2022. About Quinta do Vale Meão: An estate dating back to 1894, created by the famous Dona Antonia Ferreira, currently owned and operated by her descendants, which includes the owner Javier de Olazabal, and the winemaker Francisco Olazabal. Up until 1999, the grapes from this Quinta were sold to A.A. Ferreira S.A., a company established by Dona Antónia’s descendants; Javier then acquired all of the shares for the Quinta, becoming its sole owner, giving him the opportunity to pursue his dream of producing his own wine together with his family. Since then, they have produced both red and white still wines, as well as a Port wine. #13 Fonseca 2011 Vintage Port: Another young vintage, Kim Marcus notes this vintage as being powerful and rich with dark plum, blackberry spices and cherry, with a long dark chocolate and toffee finish. Displays exceptional purity, which is a hallmark of the 2011 vintage. Every Fonseca Vintage come from the brand’s estates of Cruzeiro and Santo António near Pinhão, which have contributed to the firm’s Vintage Port blend for 100 years, as well the Távora Valley property of Quinta do Panascal. Expected to be best between 2040 through 2060. About Fonseca: Fonseca is one of the oldest Port wine houses, and has maintained a level of consistency and quality for centuries. Today, it is a part of the Fladgate partnership, consisting of Taylor’s and Croft, two other historic and respected names in Port wine. Fonseca produces Port wine exclusively, and is unique in that every Fonseca Vintage Port was made by one of the Guimaraens family members, who have been a part of the brand since the late 1800s. In fact, David Guimaraens Wine Director for the Fladgate Partnership, produced two 100-point wines in his first vintage. #27 Quinta do Portal Colheita 2011: Produced from Tinta Roriz, Touriga Nacional and Touriga Franca, this wine is carefully fermented at a slightly low temperature to preserve the freshness of the fruit, then aged for 9 months in French barrels. Kim Marcus calls this a decadent red filled with mocha, hot spice and chocolate notes. Smokey finish with hints of cedar, it is ready to drink now through 2019, and is a great value. 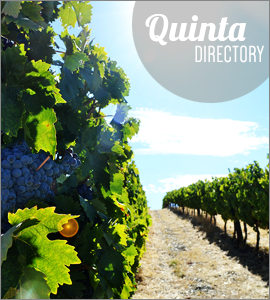 About Quinta do Portal: A family winemaking company that produces a range of still wines, Port Wines, Moscatel, sparkling and even Vinho Verde. Beginning with the family production of Port since 1890s, the estate has integrated modern wine making and grown quickly, but has always kept its focus on quality. Paulo Coutinho is the winemaker, with Miguel Sousa managing the vineyards. Composed of Quinta do Portal, Confradeiro, Dos Muros and Abelheira, The total vineyard area is roughly 100 hectares. In addition to their portfolio of award-winning wines, they also have a renowned restaurant and lodging for wine tourism, Casa das Pipas, all of which are on the estate. The modern cellars of Quinta do Portal were designed by famous Portuguese Architect Siza Vieira, which won the Douro Architecture Prize in 2011. Many congratulations to the estates included, we couldn’t be more excited to see the Douro getting the recognition it has long deserved! A Port wine at the very top of this list, and 2 Douro still wines in the top 4 is a fantastic way to bring more focus and exposure to the Douro. Port wine may have put this region on the map, but with so many quality still wines receiving accolades within the past few years, the bright future of the region could be a fair fight between traditional Port wine, and modern still wines. Photos courtesy of Dows, Prats & Symington, Quinta do Vale Meão, Kobrand wine and spirits, Quinta do Portal.